Last Chance to Log Your Walk for Wildlife! There are only a few days left to Walk for Wildlife. Our national Walk for Wildlife campaign wraps up on May 22, the International Day for Biological Diversity. This year, as we celebrate our 50th Anniversary, our wildlife ambassadors during our walk are species that CWF has helped over the past five decades. 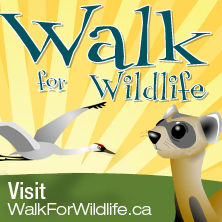 So head outdoors for a walk and then log your kilometres at WalkforWildlife.ca to so the North American bison, porcupine caribou, peregrine falcon, whooping crane and black footed ferret can cross the finish line in their virtual relay across the country. Next up: Rivers to Oceans Week! Proclaimed by the United Nations in 1993, International Day for Biological Diversity is an opportunity to increase our understanding and awareness of biodiversity issues. This year’s theme, Marine Biodiversity, ties in perfectly because as the Walk for Wildlife draws to a close, a new wave of action is cresting with Rivers to Oceans Week. From June 8 to June 14, Rivers to Oceans Week is your opportunity to celebrate the water that makes Canada special and to recognize that ocean health is a freshwater issue. Because most inland bodies of water eventually drain into the sea, every community in Canada is linked to the oceans, so having healthy watersheds is important. Though you may not realize it, your day-to-day activities have an effect on Canada’s marine habitats and wildlife. From dumping leftover paint down the drain to using pesticides in the garden, the actions we make in our day to day lives can contribute to water pollution. It’s up to us to keep our waters clean. We’ve got two challenges for you this Rivers to Oceans Week! On June 1, come on over to RiverstoOceans.ca and take the Water Challenge. Are you Mr. Fix It? A Clean Freak? Ms. Green Thumb? A Beauty Queen? We’ve got a water challenge for everyone. Pledge to make your daily activities a little gentler on our waterways this Rivers to Oceans Week. We’d also love for you to take part in this year’s Water’s Worth It! video contest. 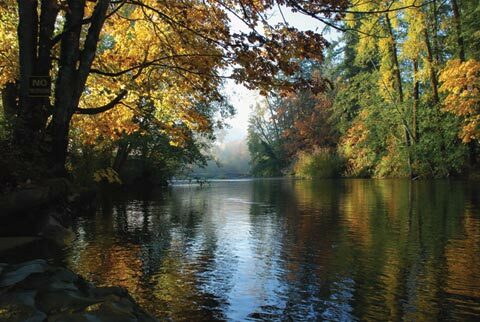 Send us a one-minute video telling us what’s so special about your local body of water and why it’s worth conserving. If you win, CWF will contribute $2,000 in funding towards a water-conservation project in your area. The contest is only accepting entries from June 1 to June 30, 2012, so hurry and get your video cameras rolling today! And if you are under the age of 19, be sure to enter the CWF Get to Know Contest. This year, there is a new Rivers to Oceans category and the winner will receive a special prize package to visit the Shaw Ocean Discovery Centre and go whale watching in Sidney, BC. Learn all about the contest, how to participate and get full details about the contest prizes at GettoKnow.ca. Don’t forget to log your kilometres for the Walk for Wildlife by May 22 then join CWF on an ocean of discovery during Rivers to Oceans week!